In 2010, we started writing a new story for kids in Multnomah County. Chapter 01, that was released in Summer of 2013 was the first chapter in our shared work and helped to explain how this community was organized to adapt a local cradle to career initiative. In Winter 2015, we released Chapter 02, as well as a companion overviewof our shared work. 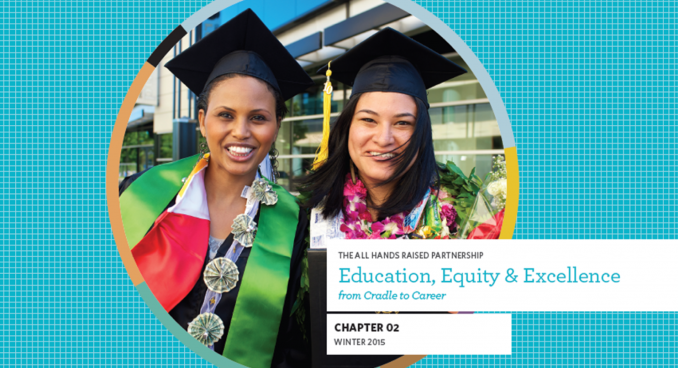 Chapter 02 highlights the dynamic work happening throughout the All Hands Raised Partnership, sharing the progress, challenges, impact and accomplishments of our collective efforts to improve outcomes for the more than 225,000 children and youth living in Multnomah County. The improvements you will read about in Chapter 02 are at the heart of why our community created the All Hands Raised Partnership. And, we have many chapters ahead. You can also dive deeper into up-to-date data on each of the 12 community-wide Indicators prioritized by the All Hands Raised Partnership using our online data tool.